When is it Safe to Customize the Plans? At Mechanical Elements, we encourage customers to modify and customize the plans. That’s how you build the perfect project. So, what things can you customize? And what shouldn’t? You’ve been thinking about this new project for a long time. 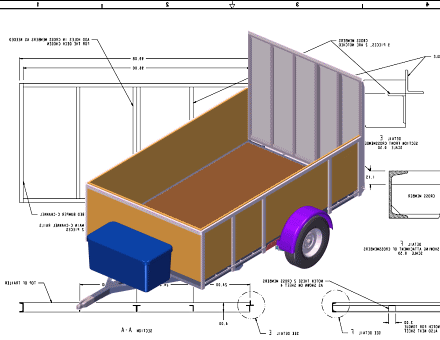 (We’ll use a special 4.5’x6′ trailer as an example.) You want a smallish trailer to tow behind your Jeep, but you also have some great ideas for customizing that will make it perfect. So, you search the web and find some things similar, but not exactly what you were thinking. At this point you realize the best way to get what you want is to build it. That’s a cool idea too, because you enjoy a good DIY project. You then turn your attention to finding plans, good plans. And again, you don’t find the perfect ones. You could just make do and settle for something available, but what if you customize the plans? What if you buy some that are close, then customize the plans to exactly what you want? Well, that could be a lot more work, and what if you make a mistake? What if you modify something that shouldn’t change? These are valid concerns when you customize the plans, so let’s talk about what matters and where you are free to make changes. Do-It-Yourself is the name of the game at MechanicalElements.com We know that every customer has a little bit different idea about what is perfect, so we encourage you to customize the plans to fit your needs. However, we always want you safe, so this article is a guide to safe customizing. Of course, are all our plans are engineered to meet and exceed the limits stated in the descriptions. And, we know that modifications to the plans can change the engineering, so it’s important to understand what areas can change, and what cannot. Here are some guidelines to help you make the right decisions — and to help you avoid issues. In some plans, like the Speakers, there is not much to require strength. Modifications to those plans will not likely affect strength. Certainly changes will affect the sound performance — lik if the internal angles or volume changes. However, when we consider structural projects like a gantry crane, beam and leg strength are critically important. Changes to these parts can drastically affect load capacity and safety, so be careful if you wish to customize the plans in areas of strength. Calculate Safety Factors for the modification, and make sure it’s good. Often a material size change can make a modification work. These are two examples of changes — one that does not affect safety, and one that might. In general, it’s fine to modify the plans in areas that do not affect strength. For areas where strength is important, like in the gantry crane example, it is almost always OK to shorten the overall dimensions or reduce loads. 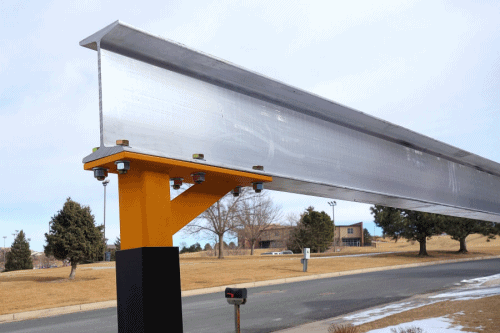 For the crane, the design is a 10′ I-Beam, so it can safely shorten to 9′ to fit your garage. Basically the same is true for trailer frames as well. In some cases, we have anticipated areas where you might want to customize the plans. In our Upsized Gantry Crane we have included this graph to help understand the practical limits for changes in length, height and beam type. 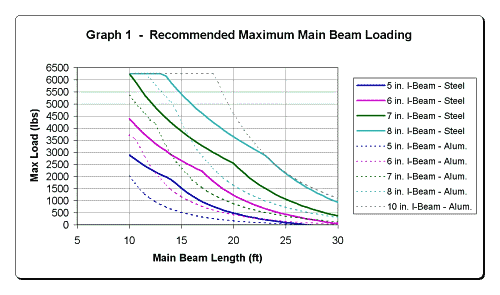 You can choose the beam size, load, and length that meets your needs. People ask a lot about changing the axle type — from a leaf spring type to a Torsion axle — for instance. This has some dangers as pointed out in this post. In this case, we don’t have a 5′ wide similar trailer, so the above technique won’t work. For this, you’ll need to assess how the width is used. If the loads won’t be anywhere near the limit, just make the trailer wider. If you’re not sure, then up-size the cross beams. In this situation, the cross members are angle iron (1.5″ x 2.0″ – 2″ leg vertical), so increasing the angle iron from 2″ to 2.5″ will make the beam stronger for the increased width. Alternatively, you could add a few more cross members. If your change in width is 12.5% as in our example of 4′ width to 4.5′ width, then adding 25% more beams will increase the strength. Another common customization is building the trailer for the way you will load it. In most cases, this simply means moving the axle to a position for stable towing with your specific load. 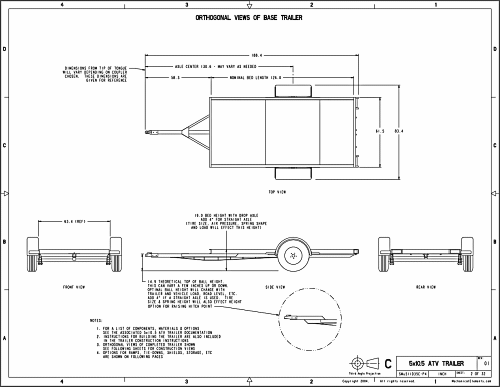 Please read this post about axle position for details. It’s not rocket science, but it does require some thinking and reasoning. Also, this method is NOT good for big changes. If it’s something small like 6″, it works great. If it’s bigger than ~15%, don’t do it. Contact us and we’ll help you figure it out. Functional changes are much easier. 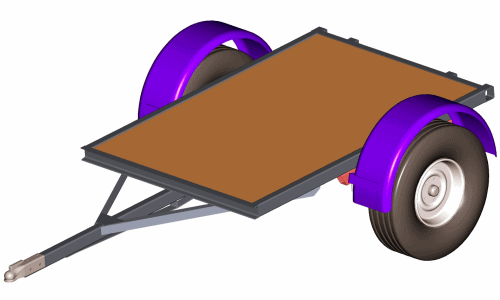 Functional things include details like how tall the sides are, where the spare tire is located, or the type of crane trolley used. Almost always, you are free to make changes in these areas without constraint. Use your head, of course. The kinds of trailer lights you choose and where you select to install them, for example, will affect visibility, hence safety when towing at night. Many of our plans include options that are, of course, ways to customize the plans. Adding certain equipment or using options that fit your needs are a way of creating the perfect and unique project. A lot of these options are listed in the product descriptions, or are shown in the product images. Many are highlighted in the animations. Incorporate them as you see fit — or modify the ideas to make options of your own. When you finish building, and when you’re satisfied with the work you’ve done, that’s when the project is perfect. Whether you customize the plans or just build it as designed, it does not matter. What does matter is how you feel about it. So go ahead, customize away. If you have questions, let us know, and we’ll be happy to offer advice.